Of course, the objective of SDN is to manage routing centrally on the network, thus supporting configuration across multiple network nodes. Because this is a difficult task at the command line, the project also comes with a web interface known as DLUX. DLUX runs as a feature or module; it was enabled in the previous installation with odl-dlux-all. You can type http://<IP_address>:8181/dlux/index.html to log on via the web interface. On the start page, the system shows the topology of the network structure that it has identified (Figure 1). You should see all the nodes registered on the network. Mousing over a host or switch pops up a tool tip with more information. 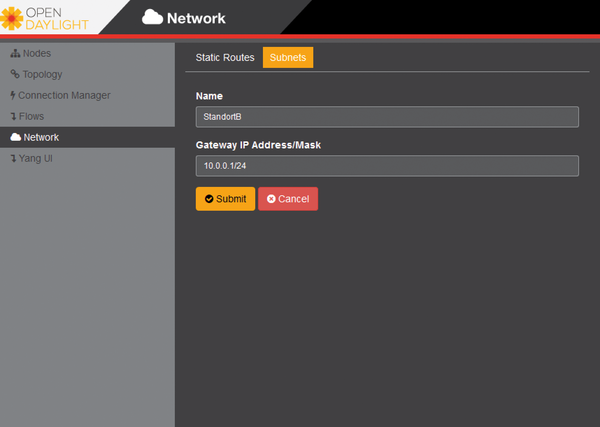 To enter a static route, change to the Network menu item and click Static Routes (Figure 2). 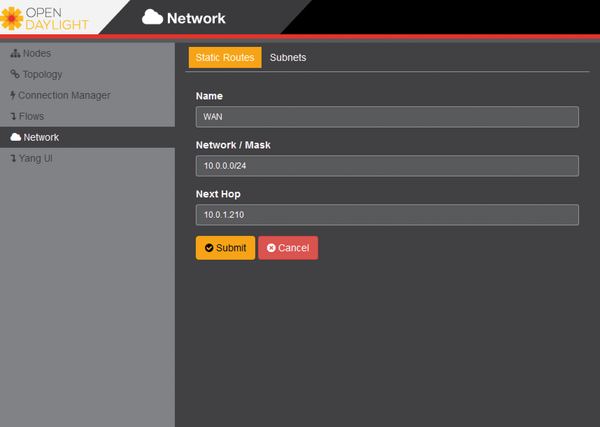 In the dialog, you can then enter the name, network, netmask, and hop count. Figure 1: OpenDaylight showing the network topology in the DLUX web GUI. The Subnets tab lets you create various subnets, and you can also specify the Gateway IP (Figure 3). The central settings help you create rules for the data traffic that OpenDaylight then distributes to all nodes involved via OpenFlow. You don't need to worry about which switches are connected to which device. OpenDaylight as the control plane takes care of all that. Figure 3: … and additional subnets. SDN breaks with the typical network and data traffic paradigm. Abstracting the data plane from the control plane allows totally new approaches in the implementation of the infrastructure. Thanks to centralized management, administrators can respond quickly to changing requirements and control the data traffic across many devices independent of the physical location. Major IT corporations have cooperated on OpenDaylight and – based on the OpenFlow protocol – created a solution that allows administrators to combine arbitrary hardware, which they can then manage using OpenDaylight as the control plane. The implementation as a Java application and modularization through features make it possible to implement SDN in a targeted way to reflect the current network requirements. Even though OpenDaylight is very easy to set up and manage, migrating to SDN or setting up a new SDN environment is a task that is not to be taken lightly. Before embarking on such a project, the stakeholders need to investigate the benefits and drawbacks for their in-house IT services and network infrastructure. Beyond this, it makes sense to call in experts at an early stage. Taking the next steps toward SDN means ditching traditional approaches and thinking outside of the box. Once you have this kind of atmosphere in place, OpenDaylight can be a very flexible solution for setting up your SDN and making any necessary modifications quickly and easily on the fly.